Keep mealtime simple with our Easy Asian Noodle Salad. Full of the delicious flavor you love, this Easy Asian Noodle Salad is a breeze to make! 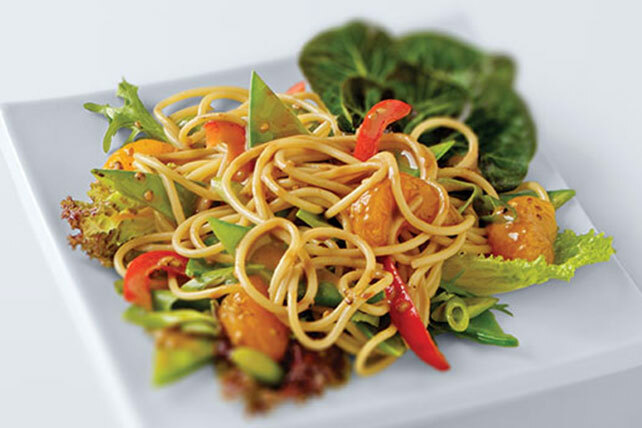 Toss spaghetti with peas, oranges, peppers, onions and dressing. Cover and refrigerate, if desired. Sprinkle with 2 Tbsp. chopped cilantro before serving. Prepare as directed, using KRAFT Lite Asian Toasted Sesame Dressing. Makes 4 servings, 1-3/4 cups each.